In an ocean of weightless air where sunlight has never been seen, only the running lights of the city of Pacquaea glitter in the dark. One woman, Leal Hieronyma Maspeth, lives and dreams of love among the gaslit streets and cafés. And somewhere in the abyss of wind and twisted cloud through which Pacquaea eternally falls, a great voice has begun speaking. As its cold words reach from space to the city walls—and as outlying towns and travelers' ships start to mysteriously disappear—only Leal has the courage to try to understand the message thundering from the distance. Even the city's most famous and exotic visitor, the sun lighter and hero named Hayden Griffin, refuses to turn aside from his commission to build a new sun for a foreign nation. He will not become the hero that Leal knows the city needs; so it is up to her to listen, and ultimately reply, to the voice of the worldwasp—because an astonishing disaster threatens Virga. 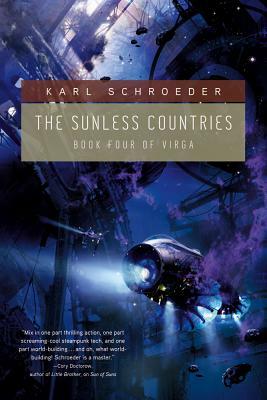 KARL SCHROEDER is the author of Ventus, a New York Times Notable book; the Prix Aurora Award-winning works Permanence and The Toy Mill; and Virga, an acclaimed epic space opera series that begins with Sun of Suns. He divides his time between writing fiction and analyzing, conducting workshops, and speaking on the future impact of science and technology on society. Schroeder lives in Toronto, Ontario.